We are the known Manufacturer, Exporter and Supplier of Ferrous Ammonium Sulfate fertilizer grade. Ferrous Ammonium Sulfate that we offer is a weak reducing agent that is carefully formulated using an accurate composition of chemicals. 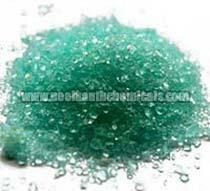 Our Ferrous Ammonium Sulfate is appreciated for its purity and effective results. We make available our Ferrous Ammonium Sulfate in safe packaging to ensure zero contamination during transit.